A few weeks before Christmas, I planned out which books I wanted to give to my kids. This is usually one of my favorite activities because, honestly, it's kind of like giving books to myself. It was fairly easy to select books for Aaron, Bradley, and Clark, but you can probably already guess that I struggled with gift ideas for Max. He loves nonfiction, and I already had the 2017 TIME for Kids Almanac because the publisher had sent me a copy, so I knew that would be perfect, but I also wanted to give him some fiction. When it comes to fiction, we often have daily battles because he asks me for suggestions but then always turns down every. single. recommendation. I think it's kind of a game with him: How many ways can I reject Mom's ideas? So I knew I was doomed from the start. 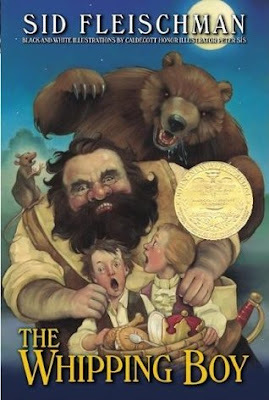 In the end, I chose two books that I already had sitting in my Amazon cart: The Whipping Boy by Sid Fleischman and Basil of Baker Street (the first book in The Great Mouse Detective series) by Eve Titus. And sure enough, on Christmas Day, he opened up the three books and cheerfully exclaimed over the almanac and instantly turned down the other two: "I don't like the movie so I know I won't like the book. It doesn't look interesting. I think it will be scary." So I did what any good mom would do. When it came time to pick our next readaloud, I opened up The Whipping Boy and started reading. And then, a week later, after we'd finished that one, I picked up Basil of Baker Street and read it aloud too. And he eagerly listened to both of them. Aren't I a clever mom? We fell in love with Sid Fleischman over the summer when we read By the Great Horn Spoon, and this one was no less of a fast-paced, thrilling adventure (and out of the two, it's probably more well-known because of that shiny gold sticker on the front). Jemmy is unfortunate enough to hold one of the worst positions in the palace--that of royal whipping boy. In some palaces, with nice, well-mannered princes who never get into trouble, it might not be such a bad job. But Prince Brat, as his name implies, is not that kind of prince, and Jemmy finds himself receiving proxy whippings almost daily. But Jemmy takes them all in stride and never cries out, which irks the prince something fierce. Jemmy is just making plans to run away when the prince beats him to it, and of course he expects Jemmy to come along and serve as his manservant. Their plans quickly go awry, however, when they're kidnapped by a pair of cutthroats: Hold-Your-Nose Billy and Cutwater. Looking at the saddle of the horse the boys were on, the bandits realize they've laid hands on more than just your average passerby--a fact which, if handled correctly, could lead to a small (or perhaps very large) fortune. With a synopsis like that, is it any wonder my kids loved this book? At every turn, there was more excitement, more danger, more tricks, and a great deal of outwitting on Jemmy's part. The chapters are very short, and each one ends with a bit of a cliffhanger, so it's almost impossible to stop once you start. The funny thing is that, for all Maxwell's complaining and being sure he wouldn't like it, what did he do as soon as we were done? Turned right around and read it again. 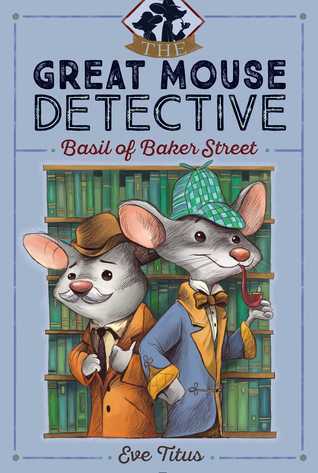 I grew up watching Disney's The Great Mouse Detective but didn't realize until a few months ago that it was based on a series of books written by Eve Titus in the 1950's and 60's. Unable to get the first book from our library, I put it in my Amazon cart and waited for the right moment to buy it (although, at less than four dollars, I think I could have justified an impulse purchase). 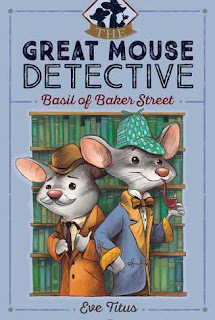 With a nod to the great super sleuth himself, Basil the mouse shares many characteristics with his idol, Mr. Sherlock Holmes: he has a loyal sidekick and friend, who also happens to be a doctor ("my dear Dawson"); he has a keen eye for detail; he's slightly eccentric; and he lives on Baker Street (where he can keep a close eye on Mr. Holmes and learn from him). When twins Angela and Agatha go missing, Basil knows there's more to this kidnapping than meets the eye, but it's not until the ransom note turns up that he finds out exactly what that is. He and Dawson don't have a lot of time if they want to save not only the twins but also their entire mouse village, but the kidnappers obviously didn't take into account Basil's quick wit and brilliant disguises. Although they're not the same stories, if you're familiar with the Disney version, you'll see the obvious influence of the book on the movie. However, I found the book much more charming. Also, there's a level of sophistication there that isn't found in most children's mysteries: the writing isn't formulaic, the dialogue is distinctly British, and the plot keeps its suspense to the very end. Plus, the characters are enough like their human counterparts to make the resemblances unmistakable, but they're still unique in their own way so that it doesn't feel contrived. Something tells me the next book (or two) might be showing up at our house for Valentine's Day . . .
How do you deal with stubborn kids who turn down perfectly good books without a good reason? Also, which readalouds have been a success for you lately? I was hoping you'd review Basil of Baker Street. The cover caught my eye on the side of your blog and I wanted it read it just from that! I've got a 4.5 year old. Do you think he's too young? We've read Wizard of Oz and a few other bigger chapter books and he loved them, but I hate to read it too early and have it flop. I think if you've successfully read The Wizard of Oz, he'd be fine with this one! It's short and has LOTS of pictures. When I described it as "sophisticated," I didn't necessarily mean complicated--just really smart and well done. It definitely shares some things with the movie but is its own story as well. Hey, would Max like the Great Brain books? They are even set in Utah. I know I'm replying to this comment super later, but I took your suggestion and gave Max the first three Great Brain books for his birthday. I'm reading the first one aloud right now, and he's devouring it! Good call. What a great reply of a reply to get on my birthday -- I bet you know the pleasure of a recommendation actually working! Thanks for the lift!